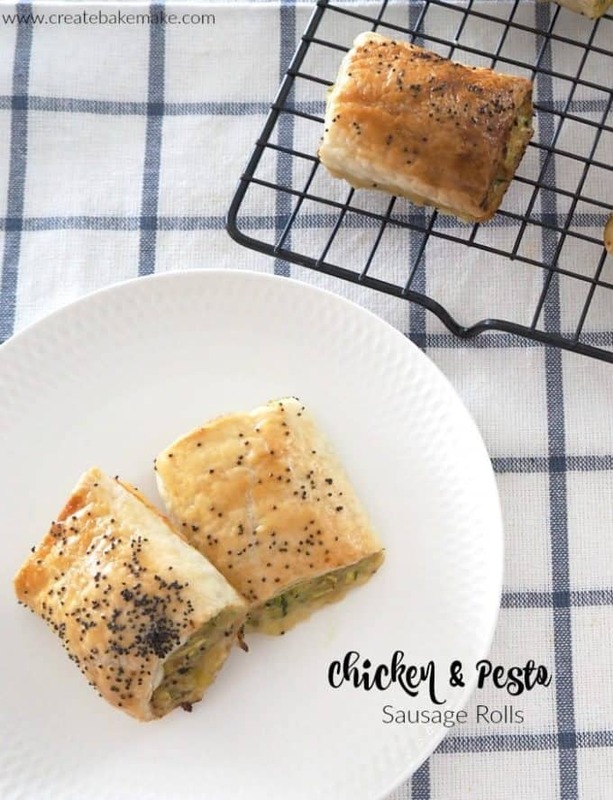 These yummy Chicken Pesto Sausage Rolls are a great way to sneak some extra veggies into the kids! There really is nothing better than homemade Sausage Rolls (served with my Mum’s homemade Tomato Sauce of course!) 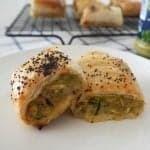 and these Chicken Pesto Sausage Rolls are a yummy alternative to my classic sausage roll recipe. To help bulk up the mixture a little (and to get some extra goodness into the kids) I like to add a grated zucchini to the chicken filling mixture, however you can easily leave this out if your prefer. These idea for these Chicken Pesto Sausage Rolls came from my Chicken, Cheese and Corn Sausage Roll recipe, and I couldn’t be happier with how they turned out. As you can see I decorated this batch with poppy seeds, however you can use sesame seeds if you prefer – or even just coat with the egg wash only, it’s really up to you. If you are planning to make these Chicken Pesto Sausage Rolls for a party you can make them advance and then store the cooked sausage rolls in the freezer until you need them. To re-heat from frozen, simply pop them into a 180 pre-heated oven for approximately 15 minutes (the time will vary depending on the size of your sausage rolls) and they will then be ready to enjoy. These easy Chicken Pesto Sausage Rolls are perfect for the entire family! They can be made in advance and frozen, you can substitute or omit the extra vegetables to suit your taste and most importantly - they are delicious! Thermomix instructions also included. 4 sheets of puff pastry - partially thawed. Pre-heat your oven to 210? fan-forced and line two baking trays with non stick paper. Crack one of the eggs into a small bowl and lightly whisk with a fork. Set aside until needed. Grate the zucchini, brown onion and both of the cheeses and place them into a large bowl with the chicken mince. Add one egg, a pinch of salt and pepper and the pesto and stir with a large spoon to combine. Place a sheet of the puff pastry onto your bench and cut in half with a knife. With a spoon, scoop up the chicken mince mixture and place it along the middle of each piece of pastry. Carefully roll the pastry over the top of the mince mixture to fully enclose it. Cut the pastry rolls in half and then in half again (four pieces per roll). Place the Chicken Pesto Sausage Rolls onto the trays you prepared earlier and repeat until you have used all of the mixture. Brush the tops of the pastry with the egg mixture and place into your pre-heated oven to bake for 25 minutes or until golden on top. Carefully remove the trays from the oven and allow the sausage rolls to cool for 15 minutes before transferring to a wire rack to cool completely. 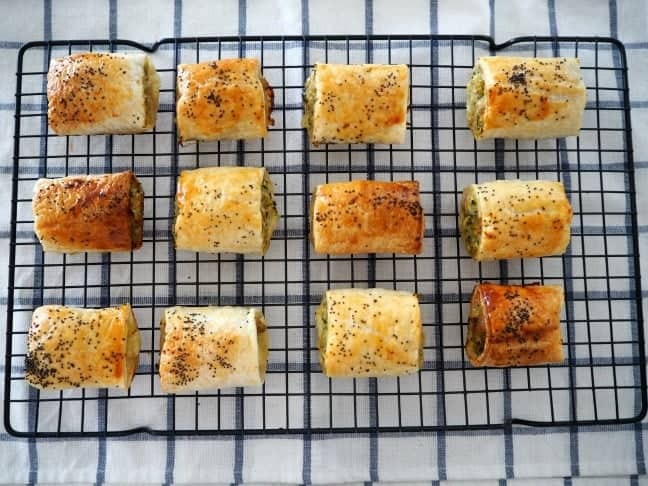 These Chicken Pesto Sausage Rolls can be frozen for up to three months. Pre-heat your oven to 210 degreees fan-forced and line two baking trays with non stick paper. Cut the tasty cheese and parmesan cheese into 3cm cubes and blitz for 6 seconds, speed 6 to grate. Set aside until needed. Without washing the bowl, add the garlic cloves, brown onion (which has been cut in half) and zucchini (which has been cut into 4cm pieces) and mix for 4 seconds, speed 6 to grate. Scrape down the sides of the bowl and mix for a further 3 seconds, speed 5 to grate finer if preferred. Scrape down the sides of your bowl and add the chicken mince, one egg, salt and pepper, pesto and the grated cheeses you set aside earlier to your Thermomix bowl. Mix for 15 seconds, speed 4. Use your spatula to push down the mixture if it has risen up towards the top of the bowl and mix for a further 10 seconds, speed 4 if the mixture hasn’t quite combined. With a spoon, scoop up the chicken mince mixture and place it along the middle of each piece of pastry. Carefully roll the pastry over the top of the mince mixture to fully enclose it.